Shortly after my post, EUR/CHF took a quick dip back below 1.54 and triggered my shorts, but it looks like the efforts by governments to pump up liquidity in the credit markets has sparked up risk appetites as we saw strength in carry trades and higher yielding currencies. With EUR/CHF sustaining its position above the falling trendline and confidence back in the markets, I think this move may extended into the Asian and European trading sessions. Not so good for a short position, so I have decided to take a small loss and close out my trade. Close EUR/CHF at market (1.5475). So, a small loss to start of the week, but it was probably the best thing to do the current conditions. It’s a crazy, emotional market, so be careful and stay tuned! Got a nice chart play on EUR/CHF to start the week off. 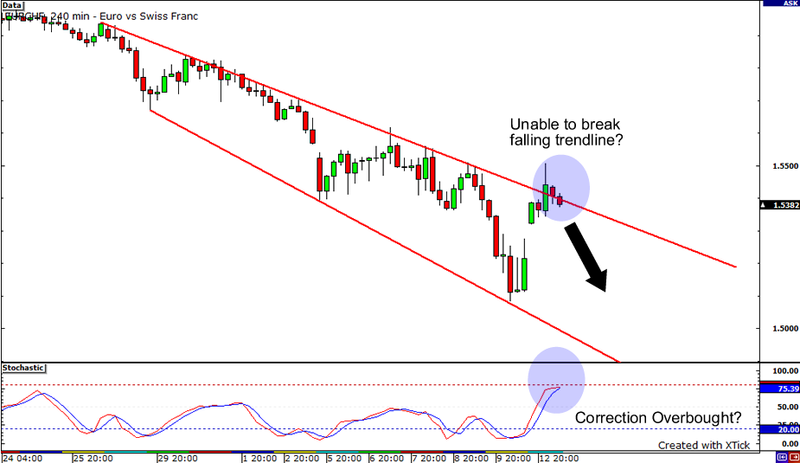 It seems that we have another chance play the downtrend as the pair failed to break the trendline. More losses to come for the Euro against the Swiss Franc? So, today’s trade is pretty simple: Short at the falling trendline. Bam!! Easy enough right? And it looks like stochastics are indicating the recent rally may just be a correction running out of steam. Fundamentally, price action is still driven by risk tolerance as a function of the developments of the credit crisis and the actions to restart the credit markets. Recent news to help fix the financial markets around this weekend includes European Bank Guarantees on bank borrowing and the G7 plans to stem the crisis. This should provide a bit more confidence to traders and investors. The market is still in a precarious situation, and new developments could change market direction in an instant. Be cautious. So, I like a short play at the moment and with EUR/CHF above 1.54, I’m going to wait till it drops lower again. I’m going to use a wide stop as the market environment warrants it, so my position size will be a lot smaller. Targeting previous lows around 1.51. If my second profit target is hit, I will leave the position open and trail my stop as I go for 1.5000. Stay tuned!